← How to call ocr2any.exe from Window Service Using C# source code? VeryPDF RSS Feed to Email Subscription delivers updates from all of your favorite news, feeds, and blogs directly to your email inbox, giving you the flexibility to stay updated whilst on the go. Yummy! 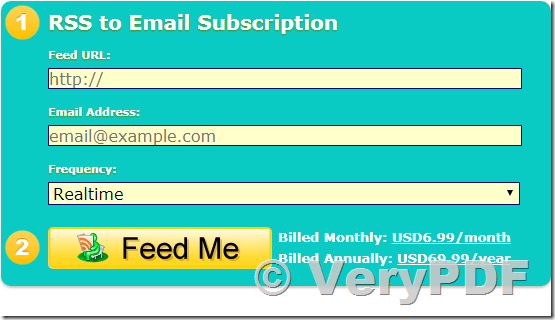 Why use VeryPDF RSS Feed to Email Subscription? As the name suggests, we deliver fresh and nutritious news to your inbox. What makes us different? We send you the things you need, at your convenience. Rather than having to constantly scour blogs and websites, (and forget half the ones you follow) we mail you updates from your own personal selection, on schedules that you choose. Create full-text feed from shortened RSS feed. Full RSS to email in real time. Real-time RSS to Email, Unlimited number of emails. Unlimited number of source feed URLs. Include inline images in the email body, you can read these emails with images offline. Full-Text RSS can figure out the language of the article being processed. Maintain same layout between original article and email. Combine several articles into one email for reading easily. Single-click to unsubscribe from the email. Best RSS to Email service for offline reading. How to set the margin and convert HTTP link to PDF? How to convert pcl to ps? How to convert px3 to jpg? This entry was posted in VeryPDF Blog, VeryPDF Cloud API and tagged feed to email, rss to email. Bookmark the permalink.